REGISTRATION FOR TERM 3 (April 29 - June 24) OF 2019 OPEN APRIL 1! We teach pole dancing and aerial arts in progressive curriculums with material to challenge the absolute beginner to the elite competitor and every level in between. Students are encouraged to work at their own pace in a supportive and non-judgmental atmosphere. Our non-curriculum selection of classes has been developed to supplement and complement our core curriculum programs. With options to aid students in developing flexibility, conditioning, endurance, musicality and dance, these fun and challenging classes are a great addition to your regular fitness routine and, if attended in addition to your regular curriculum classes, may help you progress through the levels. 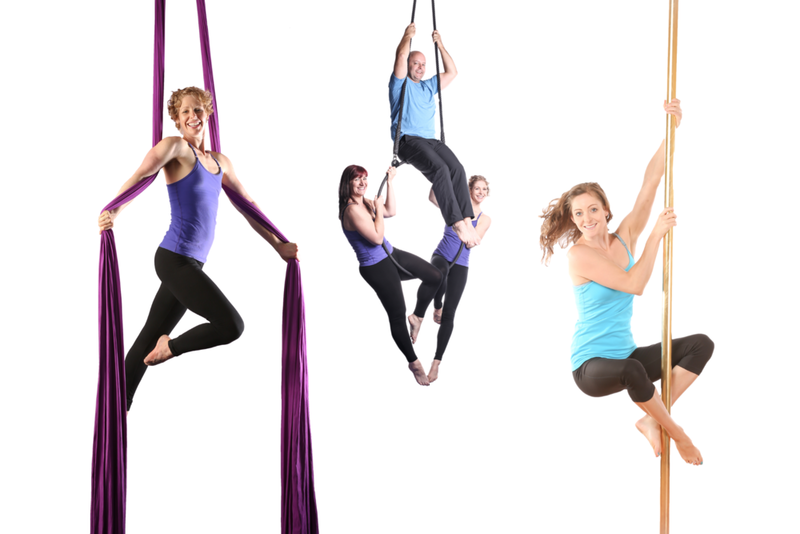 We offer fun and challenging circus themed, aerial arts centred classes for kids and youth ages 7-14. Cirque Kids, for ages 7-10, is focused on fun and exploration of movement using the aerial fabric and hoops. Youth aerials focuses more on progressive skill development, transitions and flow, but is still lots of fun, of course. For the ultimate fun time out, our Studio Party Packages are the way to go! Our spacious, accessible studio features a large pole room with 10 brass poles, a spacious aerial room with 6 adjustable rigging points, and a third room with open floor space for other activities such as chair dance, Acro Yoga, or Burlesque. We have large change rooms complete with showers. Our studio is the perfect venue for your private event. Co-ed and couples parties welcomed as well as “ladies only” events. Whether you are preparing for a competition or performance, need a little one-on-one help nailing that nemesis trick, or you just want the convenience of setting your own schedule, pace and goals, we can serve your needs. Private (1 student) and Semi-private (2 or 3 students) lessons are available by appointment. NEW for 2019, book a private curriculum session of 8 classes for your and your small group of friends (4+ students). Looking for quality entertainment for your next private function, corporate, or not-for-profit fundraising event that will delight and captivate your audience? Brass Butterflies can help! 2019 Term 3 (May/June) will run from Monday, April 29 - Monday, June 24 (inclusive). Registration is now open. We've partnered with some great companies to bring together sources for select apparel, accessories and pole and aerial related items. Some of these items are available in our studio and some are online partners. Happy shopping!